Stroud Brewery is the brainchild of Stroud native, marine biologist-trained Greg, who 11 years ago was weeding a carrot field with a fellow beer enthusiast when the realisation dawned upon him that within a 15 mile radius of where he was standing, was some of the best barley you can find (and with the best barley you can make some of the best beer). What started as a little operation, selling mostly casks to pubs, has turned into a full brewery, with a seven-strong team, that is fully commited to organic. During the week it's all work for the Strouders, but come the weekend it's a little more play, with the brewery now boasting a bar playing live music every Saturday. Oh, and they have a pizza oven too (their sourdough pizzas are something to behold). 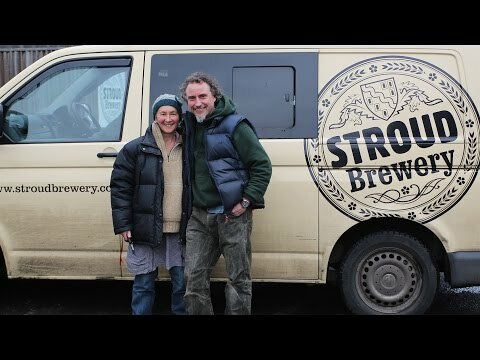 Winning awards is becoming somewhat of a habit for Stroud Brewery (their representative was recently rather embarrassed having had to get up so often at the Cotswold Artisan Drinks Awards), and no one deserves it more.